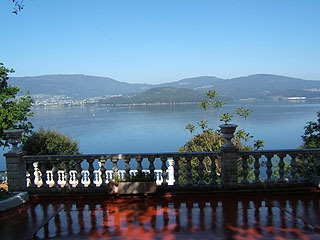 Beautiful villa in amazing location, literally over the sea overlooking the 'Ria de Vigo' inlet. Private gardens and pool (with hidro-jets) with stairs down to private beach and use of canoe. Rural setting, 15 min. drive to Pontevedra ( 9 miles), 30 min. drive to Vigo ( 22 miles), 45 min. to Santiago de Compostela ( 45 miles, most by motorway), and a public beach not far from the house ( about 2 Km). The small town of Arcade, where you have everything possibly needed, is just at 5 min. 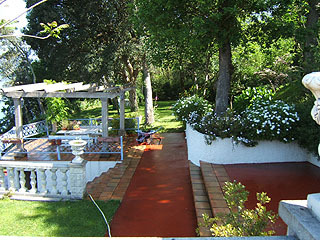 drive from the house, and there is other smaller town at walking distance from the villa ( about 1 Km). 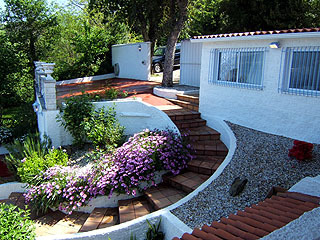 There are two entrances to the villa: one through the main gate with private parking for at least two cars, and a path with stairs down to the main level of the house, where the pool, living room, kitchen, bathroom and bedrooms ( two double, one single and one with two bunk beds for children) are located, and other trough a small door which brings you to the upper level, direct into another large living room with bathroom, and to the upper level terrace ( 60 m2). This upper level living room have two large beds with two small beds placed underneath to be used as extra beds for small children, and a sofa bed, as it is spacious enough to be used as a separated apartment, although is connected by easy stairs to the main level of the house. The house gets sun all day and the views are incredible. There is a utility room beside the entrance gate, for washing machine, laundry and storage. 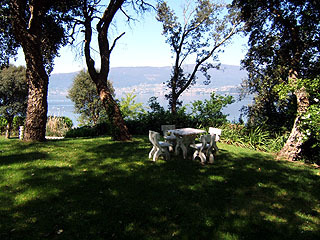 Outside: sitting area under shade, beside pool and old oak tree, two private gardens sloping down, dining area under pergola, stairs down to the sea and private beach. Cleaning lady included (four hours one day in the week). Garden maintenance included. 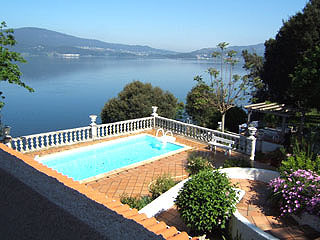 Nearest airport: Vigo ( 30 min. ), Santiago de Compostela (55 min), and Porto in near Portugal (less than 2 h.). Railway line which connects to Vigo and Pontevedra goes underground not far from the house. 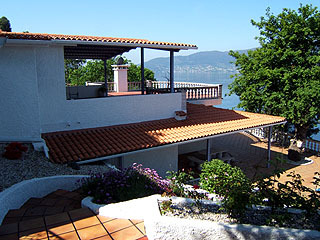 Prices are per week in euros for up to 7+2 people.